This is the latest article in The 74’s ongoing ‘Big Picture’ series, bringing American education into sharper focus through new research and data. Go Deeper: See our full series. Between whipsaw stock market closings and grim tidings from the ongoing trade war with China, whispers have spread over the past few months of a possible recession in 2019. This month’s reports of strong hiring and wage growth have quieted Wall Street for now, but some experts warn that America’s epic expansion may be enjoying its last months. But while no one (including education journalists) welcomes the prospect of shrinking markets, there might be a silver lining for schools: According to a recent study, teachers who begin their careers during recessions are more effective than those hired during sunnier economic times. The study, conducted by Harvard education professor Martin West and German economists Markus Nagler and Marc Piopiunik, has been accepted for publication in the Journal of Labor Economics, with a manuscript circulated online. Though it isn’t scheduled to be published until 2020, the article will offer guidance to education policymakers looking to navigate future downturns that may come sooner than that. The authors tracked the performance of more than 30,000 fourth- and fifth-grade teachers in Florida between the 2000-01 and 2008-09 school years. Using data from the Florida Department of Education, they matched student math and reading scores on the Florida Comprehensive Assessment Test — the state’s “high-stakes” accountability test at the time — with those students’ teachers, discarding instructors who accounted for less than 80 percent of a given student’s classroom time. 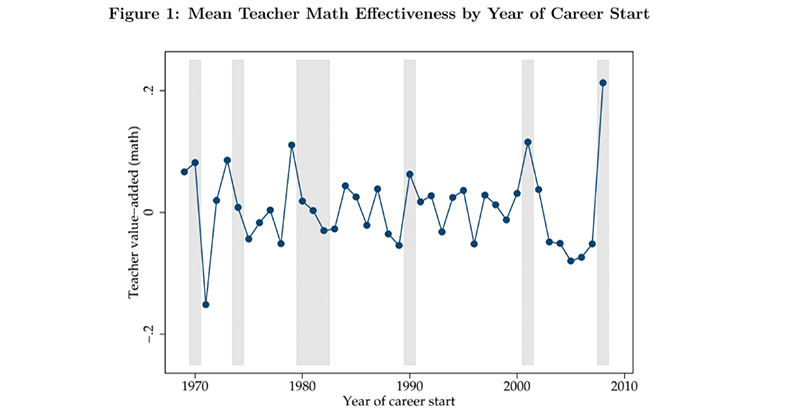 Across the 40 most recent cohorts of newly hired teachers, the team found that those who began their careers during years that saw recessions were more effective at lifting test scores. The effect was found to be statistically significant, and much larger in the case of math than English scores. That’s because, as the authors write, “existing research indicates that earnings returns are twice as large for numeracy than for literacy skills in the U.S. labor market.” In other words, the high demand for math skills in lucrative fields like engineering or computer science disproportionately draws away job candidates who would have otherwise made exceptional math teachers. In the instance of a recession, when alternative job prospects dry up, the labor market flattens out, and more are attracted to stable careers in teaching. Teacher dissatisfaction helped generate a wave of political activism last year, as educators in several states walked off the job to protest low pay. As the American economy continues its prolonged recovery from the Great Recession, public school employees are leaving their jobs at historic rates to find more rewarding work in a tight labor market. This month, unionized teachers in Los Angeles waged their first work stoppage in 30 years, demanding bigger salaries and smaller class sizes from a district that says it’s in serious fiscal straits. In an email to The 74, West said that the number of excellent teachers is “strongly influenced by how attractive teaching is relative to other jobs.” When recessions wreak havoc on the private sector, the profession becomes a safe harbor for talented professionals — but as the economic picture brightens, promising candidates look elsewhere, and incumbent educators begin organizing for a better deal. In general, recessions are thought to be terrible news for everyone, including schools. Research suggests that the Great Recession of 2007-09, which put millions out of work and cratered tax receipts for several years, had an especially pernicious effect on K-12 academic achievement. Some experts point to the diminished funding for schools in the wake of the crisis, which still hasn’t caught up to pre-2008 levels in many states. But the authors find that such catastrophes could also serve as a “window of opportunity” for state and local governments to poach great talent that would otherwise shy away from teaching jobs due to lack of pay or prestige. While startups and blue-chip firms are shrinking payrolls, they suggest, schools should be opening their books. Even during bull markets, the study concludes, schools and districts should aim to narrow the gap between teaching and other careers by lifting teacher salaries. Citing the work of Harvard economist Raj Chetty, the authors find that educators hired during recessions could be enhancing the lifetime earnings of each class of students they teach by as much as $13,000 per year. That kind of premium could justify a salary bump, they argue. The question is, who should receive it? 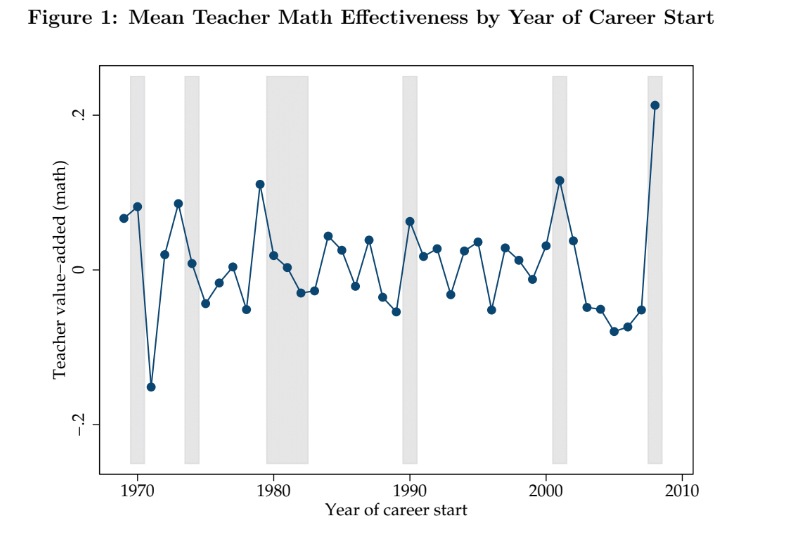 While teachers beginning their careers during recessions are more effective on average than those hired during expansions, researchers found, the effect is especially pronounced for the teachers at the very top of the performance scale. That is, the very best teachers hired during economic slumps are much more effective — the authors estimate as much as .2 standard deviations, a highly significant effect size — than the very best teachers hired when the job market is providing more openings in other fields. West cautioned that the findings weren’t necessarily an endorsement of higher teacher salaries writ large, but he said that narrower interventions — offering sizable bonuses to high-flying graduate students in STEM fields, for instance — were difficult to implement.